Looks like some one has made his move and seeing a head for the launch. At first Comex hinted about a PDF Exploit which was founded by him. Then it was expected that a new Jailbreak will be web based like Jailbreakme.com and the new version was said to be Jailbreakme 3.0. Previously Comex was seen improving the new Jailbreakme 3.0. Now a user on Twitter asked Comex about the iPad 2 Jailbreak and Comex reply was stunning. 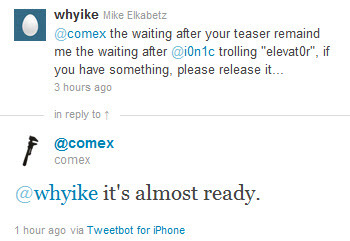 According to the Comex Tweet it looks like the Jailbreak is almost ready for iPad 2. But no words are said on the Firmware, that what Firmware will it Jailbreak? Either iOS 4.3 or iOS 4.3-4.3.3. And no words are said on the release. Lets wait for the release of the Jailbreak and see whether it is Tethered or Untethered and what Firmware it supports. Lets hope to see a Good news.